When is Best for a safari? 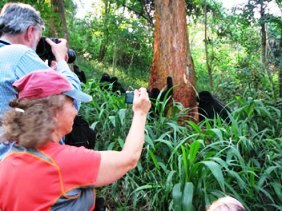 This Uganda safari tour takes you gorilla tracking (trekking) in Bwindi Impenetrable National Park, giving you chance to see over 10 primates including, black and white colobus, red tailed monkeys, etc. Bwindi Impenetrable NP is a natural world heritage site. Hikers will love it, with the gorilla excursion as a high point of your safari! 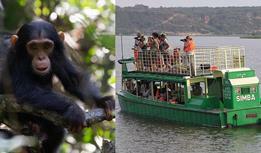 We then move to Lake Bunyonyi and explore its mystical appearance and end up with Wildlife at Lake Mburo. Get the best with Lifetime Experience Safaris – When it comes to Safari Travel, we know you have a lot of choices! 0630hr in the morning, we meet at your preferred Kampala lodging and after breakfast, leave and head southwest toward Bwindi Impenetrable Forest National Park through the Ugandan Countryside. We use the Kampala-Masaka-Mbarara road, stopover to view the equator at Nabusanke trading centre, take photos and continue to Mbarara where you will have lunch at a Lake view Hotel along the way. Once at Bwindi we will register you at your choice of lodging, better or budget according to your wishes. Location of lodging can depend on where your permit is for in the park. Bwindi, Mgahinga alongside Rwanda’s Volcanoes Parks and Congo’s Virunga Volcanoes are habitats to the only endangered mountain gorillas left in the whole world. Dinner once you reach your lodging destination. Take an early morning breakfast, head to the park office headquarters with your packed lunch for a pre-tracking (trekking) briefing at 8 o’clock to go over guidelines for you and your safety. We trek through the rainforest and bamboo covered slopes, accompanied by an expert UWA guide and other trackers (if any but not more than 8 total in your party all above 15 years), in search of a mountain gorilla family. The gorilla tracking (trekking) at Bwindi can last from a few hours to the whole day. Just as I always mention in all other gorilla tracking safari itineraries, mountain gorillas never live in one place twice; they move and build a new nest every day so there is nothing like closest or farthest gorilla family. Once sighted, you will be guided to within 5 metres from the gorillas, sit around them for a whole hour while gazing into their big round eyes. The gorillas are shy but peaceful animals but it’s simply a powerful memorable experience to see these animals up close. There is a chance to see over 10 primates in this jungle. Depending on the time you return from the tracking to the lodge, you can take a walk and visit the villages in the area, interact with the local people. Participate in captivating traditional performances presented by Women’s groups or orphan children groups. Visit the pigmy village and you will have some cultural insights into the local Batwa culture. Note that the fees you pay for these performances go directly to improve the welfare of families around the park. Go here for more information about Bwindi Impenetrable Forest National Park. Dinner at your lodging and wait for the next day. You can go for an optional guided nature walk in Bwindi after breakfast then head to Lake Bunyonyi. But this should depend on whether you should use the village trial or one of the five trails. After lunch break, we depart for Lake Bunyonyi. 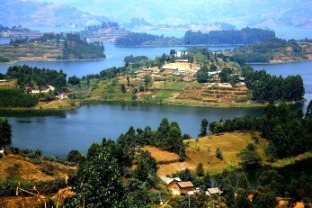 Lake Bunyonyi is another major tourist stopover that is undeniably amazing. It is the 2nd deepest lake in Africa, it contains lots of the tasty crayfish, so get set for a culinary delight. Bunyonyi is a local word that means “many small birds” in direct translation. It a must stop for committed birders and besides that its serpentine shape and numerous Islands other highlights one must look out for. Check in at your preferred Lake Bunyonyi lodging. There are many things to do here; you can do a canoe ride, check out several islands like Bwama Island good for birders or you could take a nature walk along shore on one of the islands helping you to appreciate a variety of small birds or simply relax. Well deserved after a day of gorilla tracking the day before,....dinner at your lodging. Breakfast, and head to Lake Mburo Park that is nearby and another beautiful Park. Check out the lovely Kigezi highlands, the scenery is simply soothing to the eye in the evergreen state of Africa. Arrive for lunch at your choice of lodging at Lake Mburo. 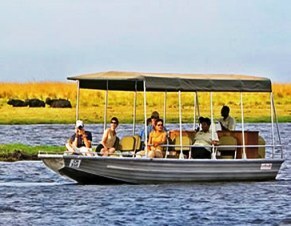 After lunch go for the afternoon Boat Safari on Lake Mburo where you will see several other lakes such as Kazuma, Lake Bwa. Gaze at the huge hippos, crocodiles and buffaloes as they drink water. There are attractive birds to check out like Abyssinian ground hornbill, the crested crane (Uganda’s national emblem), saddle bill storks among others. You can do an optional guided nature walk. Return to the lodge for dinner and a quiet overnight in the midst of the African savannah. Breakfast and a morning Game Drive through the savannah or an ultimate treat. Check out Uganda’s wildlife besides the mountain gorillas in Bwindi such as zebra, warthog, buffalo, klipspringer, eland, oribi and waterbuck. Lake Mburo national Park, a haven for “impalas” small antelopes and herbivorous are most concentrated in Lake Mburo of all the Ugandan national Parks. There is more to impalas, Kampala; Uganda’s capital derives its name from here, it’s beautiful animal. A horseback safari, ATV quad safari tour is also possible. The choice is yours. Drive to Kampala with stops at Mbarara for lunch, along the equator if you missed on the first day and at the Buganda Royal Drum Makers. Arrive in Kampala in late afternoon....Creating everlasting memories of the Pearl of Africa. Not included drinks such as alcohol, laundry, phone calls, tips to lodge staff. 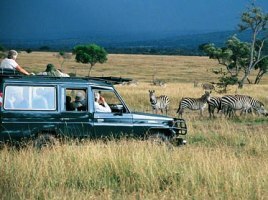 Feel free to contact us any time and book this Safari tour. We are here to answer any questions you may have. Whether its safari itineraries, competitive pricing or general information on any of our services/tours, we are just a phone call or few clicks away, shoot us an e-mail today, ...we look forward to hearing from you. Uganda National Parks & Wildlife Reserves Information: top safaris destination. Your Packing List for a Safari in Uganda - The Essentials! Things to pack for Gorilla Tracking. Large group travel; – this means massive reduction in prices, Do you ever save on big teams?? Self drive; Is there such a thing in Kampala - Uganda?? Things to do and see in the Pearl of Africa-Uganda. Whether you are looking for additional Uganda safari information, Safari itineraries, competitive quotes, or have any other questions, feel free to contact us at or even just call +256 (0) 777201697, we are always happy to answer your questions.